Famed for its cultural​ individuality, unique architectural treasures, gastronomical delights and physical beauty; this is a city with a truly ​multi-faceted character. ​Barcelona has cleverly succeeded in embracing its past​, while wholeheartedly welcoming the future​. It has a wide cultural programme, ​with world-class museums, art galleries,​ exhibitions promoting the most innovative artistic trends, open-air sculptures… and many concerts, plays and dances coexist​ing alongside traditional festivals and festivities​. Expect to 'strut your stuff' in the limelight! Before you hit the good time with your personal activity entertainer and videographer, your group is divided into bands of 8-10 members each. We supply all the equipment and outfits and help bring teams together in a creative environment... to pool their ideas and create something fabulous to brief, in a short timeframe. We'll also help steer the many fun aspects of this challenge. Our coordinators help you to come up with a storyline and styling for your video before filming commences. Don’t worry – you don’t actually have to sing (unless you want to!). The chosen song is played for you and the teams sing along; we'll give you the lyrics beforehand, so teams can learn the words. W​ondering the streets of Barcelona may well bring some surprises. As well as the incredible architecture, there are some gorgeous green spaces, a lively nightlife and a splendid seafront with wonderful beaches and a range of modern facilities. Local markets are legendary; fabulous atmosphere and excellent quality produce coincide with a chance to socialise. 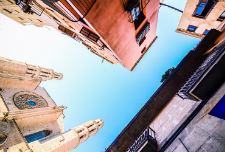 As historic as it is modern, Barcelona's food boasts some of the best traditional gourmet delicacies in Spain, ​plus ​amazing fastfood, bistro cooking, beachside dining with a twist and more...​ all with the emphasis on 'big flavour'. Weather-wise, winter often offers azure skies and improbably warm days, while summer – though humid – ​is often not as blisteringly hot as other Spanish cities.